My friend Roy from MadTown came by this evening, en route to bringing his son Craig to Camp Pendelton. I am fortunate that he also brought me a little sampler from America's Beer-er-Dairyland. 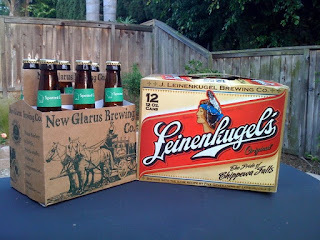 A sixer of Spotted Cow (ambrosia - the drink of the gods) and 12 cans of Leinies (the elixir of life). We took him and Craig to Pizza Port. All is well. Thanks again Roy, don't be a stranger!